Real estate is more than just a sale. Sarah uses the slogan Beyond Sold to convey that closing on a home is more than just a single transaction. She has the experience to give you the guidance and navigation through the process. Sarah knows that you’re savvy and have done your research and she comes prepared with the technology and tools to assist you along the way. She speaks your language – email, text, face-to-face conversations that revolve around your needs and goals. After the sale Sarah will stay in touch. She wants to know how you like your new home and new neighborhood. If you’ve moved out of the area she wants to make sure that you’re settled in to wherever your next chapter has led you. Real estate is a relationship, not just a transaction. That’s what she does and that’s what she stands for. Sarah labels herself as detail-oriented and meticulously organized. Within the real estate industry she especially enjoys creatively marketing homes for sale and maintaining a house of neighborhood websites. When clients come back 5+ years later to list their home that Sarah helped them originally purchase she knows that’s proof of a successful relationship. In 2013 Sarah earned her broker’s license to demonstrate her higher level of education and to stand out amongst the crowd of other licensees. She also has her Sellers Representative Specialist designation. Sarah earned 2016 Agent of the Year with RE/MAX Masterpiece Realty. She was also awarded 2012 Realtor of the Year in St. Lucie County with the local association of Realtors. 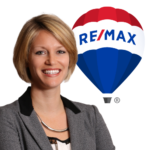 Real estate is Sarah’s full-time career and she’s been with RE/MAX Masterpiece Realty since the beginning. RE/MAX Masterpiece has been a beloved brokerage in Port St. Lucie since 2006 and is located in the popular southwestern quadrant of the City just 2 miles east of Tradition off of exit 118 from I-95. Our office is open 7 days a week and employs a full-time staff to make sure the operations run smoothly. When it’s time to make an offer or consult about your property we have three spacious conference rooms to discuss your needs in private. If we represent your property for sale, the front desk fields inquires and can book showing appointments on your behalf. We manage your transaction electronically so that if you’re out-of-state we can handle the paperwork digitally with ease. The RE/MAX brand is internationally known and recognized and has a wide reach locally on the Treasure Coast and globally online. RE/MAX associates have more real estate sales expertise than other real estate agents and RE/MAX leads the industry in brand awareness with the largest share of voice in national TV advertising.